Gregory Nisbet stands up after he was found not guilty of manslaughter by Cumberland County Superior Court Justice Thomas Warren. Nisbet is the landlord who owned the Portland building where six young adults died in a fire in 2014. 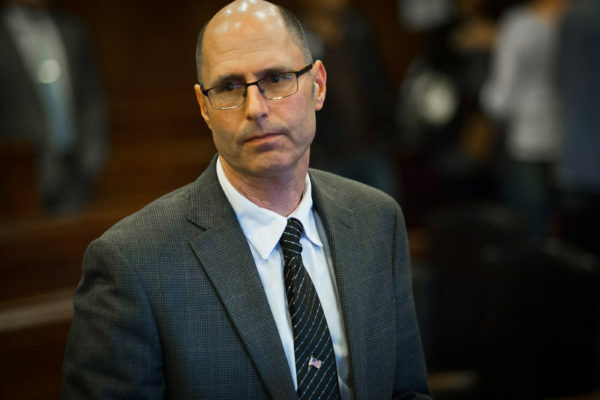 PORTLAND, Maine — A judge has denied the request for a new trial by the landlord who was sentenced to 90 days in jail for his role in Maine’s deadliest house fire in decades. Gregory Nisbet — who was convicted last October of a single fire code violation, but acquitted of six counts of manslaughter and several other code violations related to a fatal 2014 fire at his Portland duplex — will not be allowed to stand trial again nor have his single misdemeanor conviction dismissed, Cumberland County Superior Court Justice Thomas Warren ruled last week. The decision comes as the latest step in drawn-out legal proceedings that have sought to hold Nisbet criminally and civilly responsible for the accidental fire at 20 Noyes St. that killed six young adults on Halloween three years ago. In a rare criminal conviction against a Maine landlord, Warren ruled that while Nisbet’s upkeep of the duplex he rented to tenants did not constitute criminal negligence, he had violated housing safety code because the third floor windows were too small and did not open wide enough to provide a second means of escape. Three of the people killed in the fire were found on the third floor. After Warren sentenced him to jail time and to pay a $1,000 fine, Nisbet’s lawyers requested a new trial for their client, claiming that state prosecutors had not sent them a vital piece of evidence until after the verdict was handed down. Warren found that Assistant Attorney General Bud Ellis had, in fact, failed to give Nisbet’s defense team a 2013 memo from the Fire Marshal’s office that laid out a policy allowing windows in buildings built before 1976 to be slightly smaller than those in newer structures. Nisbet’s Noyes Street building dates back to the 1920s, according to court documents, but Warren ultimately found that the missing memo was not enough to “undermine [his] confidence in the verdict.” In short, he found that regardless of the historical leeway, the third floor windows were too small. “There is no question that the third floor windows were just too small under any standards to constitute a secondary means of escape,” wrote Warren. Nisbet’s lawyer Matthew Nichols said his client is reviewing the decision and can still appeal Warren’s original verdict in the case. The people killed in the fire were David Bragdon Jr., 27, Ashley Thomas, 29, and Nicole Finlay, 26, who lived at 20 Noyes St., and visitors Steven Summers, 29, of Rockland, Maelisha Jackson, 23, of Topsham and Chris Conlee, 25, of Portland.